Elbow is a British alternative rock band, comprising Guy Garvey (vocals, guitar), Richard Jupp (drums, percussion), Craig Potter (keyboards, piano), Mark Potter (guitar, backing vocals), and Pete Turner (bass guitar, backing vocals). The band has contributed to two albums benefiting War Child. 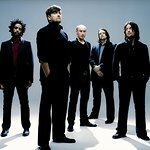 We don't have any videos related to Elbow.